Moving Files Across Websites in Rackspace Cloud Sites is easy than you can think. Basically you can move using WinSCP in Windows PC using a flaw of Windows OS. Moving Files Across Websites in Rackspace Cloud Sites is basically from technical aspects is not possible specially from one client account to another cloud account. We will show a method that actually uses a security flaw in Windows PC and as website owner, although you are getting advantages for it, must be aware of and can restrict it. Moving Files Across Websites in Rackspace Cloud Sites across sub or client account is not possible according to Rackspace Support. Yes, the configuration is done from UNIX networking in an way that, moving (mv) files is only possible within a domain named folder. This Moving Files Across Websites in Rackspace Cloud Sites is not only a easy guide but a security waring and the procedure you should follow to disable it. It is a move from drop down list from client account to parent account. That is it. Our domain, however is not publicly available in that in Rackspace Cloud Sites location as shown in screen shot, its an old backup, but it works for live sites too. This under proper configuration would evoke an error as the client account’s file is actually getting deleted without the need of login ! The ‘legal’ option is – Duplicate. This odd unsecured condition allows Moving Files Across Websites in Rackspace Cloud Sites, for example from client site to root account. 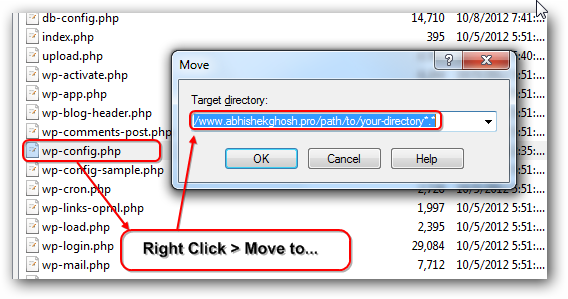 Just deleting the domain and adding it again with proper ownership of account from Control Panel will give a nearly one click movement with few clicks. This is a security flaw and the sessions are stored as text files which is very dangerous for Windows due to virus, malware etc. This flaw is not possible to fixed by any server company as it is you who is using a bad option – using username password to login and storing it. This Article Has Been Shared 756 Times! Cite this article as: Abhishek Ghosh, "Moving Files Across Websites in Rackspace Cloud Sites," in The Customize Windows, October 27, 2012, April 18, 2019, https://thecustomizewindows.com/2012/10/moving-files-across-websites-in-rackspace-cloud-sites/.